The FA 2016 schedule is under development and is not the final released version. Students should not use this for course planning. *This section will be recorded for future online use. *This is a hybrid section taught both online and in the classroom. Hybrid courses run the length of the full semester. An advanced study of principles of Bible study emphasizing synthetic, historical, analytical, topical, theological, biographical, and devotional methods. A study of the practices of everyday life in the ancient Near Eastern and first-century world that illumine and explain the Old and New Testaments. May also be credited in the Department of Old Testament Studies or the Department of New Testament Studies. An expositional study of the Book of Job, giving attention to the nature of the book, its content, and its relevance to theology and attitude toward God during times of suffering. An analytical and expository study of the parables of Christ, with attention to the hermeneutics of parabolic literature in the Scriptures. An introduction to the discipline of biblical theology that includes study of its history, principles, and methods. Readings in significant authors will form the basis for class discussion. A course designed to introduce the student to the ethical and legal standards, professional organizations, educational standards, and the appropriate role of practitioners in the field of counseling. A course designed to train students in the theory and skills necessary to conduct a marital-enrichment program. The student will learn various models designed to strengthen marriages not in crisis. These models will be examined within a theological framework, with an emphasis on integration as well as on specific skills and strategies. Enrollment requires consent of the professor. An introduction to the family-system approach to intervention, which integrates marital, sibling, and individual subsystems, as well as family-of-origin and external societal influences. Biblical perspectives, clinical diagnosis, and treatment strategies are emphasized. *Spouses are welcome to attend this class for free. Please complete the spouse audit form via CampusNet. *This is a hybrid section with both online and in-class elements. A hands-on exploration of speaker-support media for face-to-face teaching, with emphasis on clear communication and aesthetic design. (see EML105 and MW502). A study of the principles of academic governance, including the nature and function of church-related institutions of higher education, with attention to the responsibilities of leaders in academic affairs, student services, business affairs, development, and general administration. This course is an advanced study of communication principles for leaders. Students will develop communication skills, principles, and plans for their organization, staff, and/or ministry through an effective biblical process. A study of women in their capacity as the audience and also as learners, with multiple opportunities to create and practice relevant, biblical presentations and studies for large groups, retreats, and conferences. Prerequisite: BE101 Bible Study Methods and Hermeneutics. Enrollment limited to 15 students. A study of the history of Christian spiritual formation from the patristic era through its contemporary evangelical expressions designed to introduce students to the rich resources of the Christian tradition available for providing nurture and guidance in soul care. This course is designed for students who choose to participate in special conferences, training, or programs that are more formal in nature and require student participation other than a standard independent study. Approved special topics will provide expertise or training not specifically covered in the Seminary curriculum. Credit is allowed proportionate to the required amount of work but is not to exceed 4 semester hours on any one topic. Enrollment requires consent of the department. A study of the development of Christian doctrine from the second to the fifth centuries. A course on major writings of the American theologian Jonathan Edwards emphasizing the doctrine of salvation. A study of the principles of graphic design and the mechanics of layout and composition to produce finished projects for both print and digital publications aimed toward solving communication problems in a ministry setting. Students will also give attention to the creation of a digital, graphic-design portfolio. This course will explore theological study through collaborative practices of research, discussion, and art-making (music, video, painting, acting, poetry, etc.). Four theological concepts will be explored in groups to develop those concepts and to create works of art that embody their truth and mystery. Enrollment is limited to 12 students. *This section is taught in Spanish. A study of exegetical method in the Gospels, including a literary analysis of Jesusâ miracles and parables, the use of extrabiblical resources, a look at biblical theology of the gospels, and issues tied to the historical Jesus. 3 hours. An exegetical study of 1 Corinthians with attention to selected theological issues in the epistle and their application to contemporary church life. Exegesis of the Greek text of the Epistle to the Hebrews with consideration of the use of the Old Testament in the letter. Exegesis of the Greek text of 1 and 2 Peter and Jude, with attention to the problems of introduction, interpretation, and the theology of these epistles. *Class meets on the DTS-DC campus for full-day sessions on Saturdays, 9/17/16 and 11/12/16. Class sessions will also be conducted by web-based video at 4 designated times during the fall 2016 semester. *This is a hybrid section taught both online and in the classroom. Instruction in preaching the Psalms and Old Testament prophetic passages. Students preach three times, including a 'portfolio sermon,' and develop a preaching calendar. Required of all students in the Homiletics emphasis. 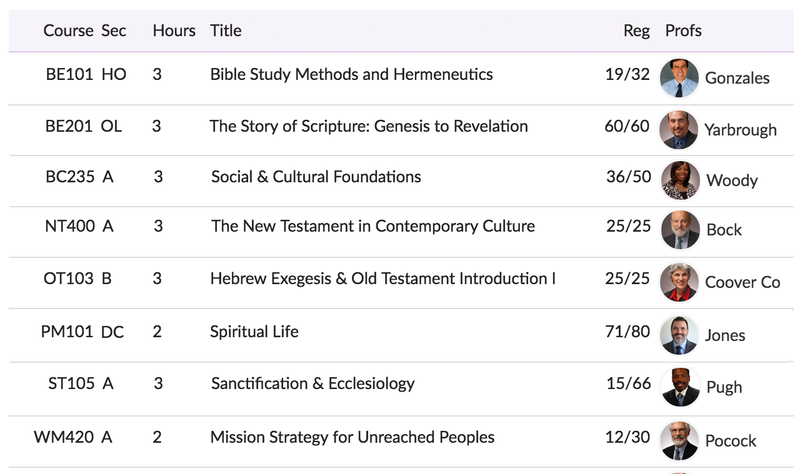 Prerequisites: PM104 Expository Preaching II and OT103 Hebrew Exegesis. Enrollment limited to 14 students. A practicum in the teaching of homiletics. Students practice teaching basic communication principles, guide the homiletic process, evaluate messages, and provide constructive feedback under the professor's supervision. Prerequisite: PM103 Expository Preaching I. Enrollment limited to 6 students. A study in the history of Christian spiritual formation from the patristic era through its contemporary evangelical expressions designed to introduce students to the rich resources of the Christian tradition available for providing nurture and guidance in soul care. 3 hours. This course is designed to guide students in the use of library materials, computerized databases, and bibliographic resources. It provides instruction in research strategies, thesis topic selection, and the proper form and style for papers and theses. In addition, this course provides an orientation to the educational philosophy of biblical, theological, and ministry-related studies at DTS. 1 hour. *Hybrid section requires online participation and coursework. Class meets in person Saturday, October 15, 2016. *This is a hybrid section with both online and in-class elements. Hybrid classes run the full length of the semester. *This is a hybrid section with both online and in-class elements. Hybrid courses run the length of of the full semester. A seminar for synthesizing intercultural principles from World Missions and Intercultural Studies courses and providing practical preparation for personal development, interpersonal relationships, and ministry effectiveness. Should be taken in last semester of study. A seminar-style study of the cultural, historical, and religious characteristics of ministry in diverse American contexts and of the implications for ministry created by these characteristics. A study of ministry to unreached peoples and "closure strategy" in missions, with attention to identification, selection, and entry into modern unreached people groups; and the concept of homogeneous units as targets for evangelistic ministry. An in-depth study of the kingdom-agenda approach to social outreach, with a focus on the creation and development of practical strategies for effective community impact through the local church. A study of theological issues affecting missiological thinking in relation to Christianity-the uniqueness of Jesus Christ in a pluralistic world; soteriology-the eternal destiny of the heathen; anthropology-biblical absolutism and cultural relativism; pneumatology-signs and wonders, and other charismatic issues; and eschatology-premillennialism and society. May also be credited in the Department of Theological Studies. An introductory course which considers theories of language, language acquisition, and standard methods and techniques of instruction for teaching English to speakers of other languages.